The conceit is an attempt to reconstruct the IE tree by looking at articles written in English by native speakers of 11 IE languages and seeing what features they have in common. As anchors, papers by native English speakers and in English by native Japanese speakers were also used. The results are unequivocal: of French, Spanish, Italian, German, Dutch, Norwegian, Swedish, Czech, Russian, Bulgarian, and Polish papers, the algorithms correctly identify the Italic, Germanic, and Slavic families. Furthermore, Germanic is correctly divided into West and North, and Romance into Western and Eastern. Only in Slavic are things a bit strange, with Czech and Russian closest and either Bulgarian and Polish close, or with Polish an outlier as against Czech-Russian and Bulgarian, depending on the algorithm used. Native English papers, however, do not fall into the Germanic group but are remote from all 11, showing that “non-nativeness” is itself a common factor, at least from the IE languages. Japanese papers, however, are more different from the 11 + English than they are from each other, making them the very first to split off from Proto-Paper-English. I wonder if an analysis of Classical or New Latin texts would yield similar results. Can we use this “conceit” to detect the influx of Eurasians to Europe ~5,500 years ago? after a pandemic wiped out the then Euro population Is this PIE arriving? Yes, as previously discussed from here on. Ah, thank you. Pre-history: just one darned plague after another. Or in this case, one darned plague before another. I got the link to the paper not long before you posted it here and couldn’t wait to read it, seeing that the date was spot on our speculations from here about the resurgence of hunter-gatherers and the Pitted Ware Culture. I’m eager to see what they say about the genes related to transmission. Probably not until late tomorrow, alas. Is there any evidence for extensive Old World depopulations following the first emergence of smallpox or measles? Ah, some more; I see I am not keeping up: “detect the influx” or rather detect the influcted-upon, i.e. influence of the pre-PIE Euros/Scandinavians’ language would be the Germanic substrate hypothesis. Doubtless David M will correct me. I’m happy to see this have some scientific validation at last. I got tired of explaining and insisting to managers in a major multinational engineering corporation why the documentation I wrote in English for a group of engineers in Hamburg needed to be rewritten in English for a group of engineers in Buenos Aires. I read a lot of scientific manuscripts written by non-native English speakers, since I referee between thirty and forty papers each year. As part of the refereeing process, I have to look for disfluencies in the writing. While I cannot point out ever single error in a lengthy paper in my report, I do have to identify instances where the authors’ imperfect English actually impedes understanding, and I also need to make a recommendation about the overall level of language editing that the paper needs before it can be published. Over time, I have learned what to expect from authors coming from different countries, both in terms of the kinds of errors they make and how often such errors appear. There are clear differences in how well the authors write English, which have some correlation to their native languages and how closely those languages are related to English. However, I think that the generally high quality of non-native English from Germany and Scandinavia has relatively little to do with the phylogeny of those languages and more to do with the good English instruction in German and Scandinavian schools. Native speakers of French (predominantly European) typically write better English than Native Spanish speakers (who are mostly from Latin America), although the French are not as skilled in English as the Germans. Moreover, among Latin Americans, there is wide variation in the quality of the English. Mexicans, who probably have quite a bit more environmental exposure to English than Argentines, also show better mastery of English grammar. Y: Is there any evidence for extensive Old World depopulations following the first emergence of smallpox or measles? Or new forms of the flu or the common cold, for that matter. Not that I’m aware of, but it’s the right question, now that the tools are becoming available. You can’t study population history without studying depopulation history. For what it’s worth, my guess is that before the first globalization in the 5th millennium BCE, there were no pan-continental pandemics. When a new lethal pathogene emerged somewhere on the continent it could cause a local pandemic, followed by development of resilience in the surviving local population, and then either die out before reaching very far, or become (to coin a term) a local endemic. As the pathogene evolved, it could cause new outbreaks, which, again, could spread epidemically, maybe cause a new local pandemic, and either die out or become endemic. An endemic pathogene could make the leap into a new population when there was contact and cause a local pandemic there. A pathogene that became endemic in several nearly independent populations would evolve differently in each of them, as would the resilience of the independent populations, and every now and then one breed of the pathogene would jump from one host population to another, causing a local epidemic there. I imagine this to have been the case in both the Old World and the New World for a long time. With the trade and transport revolution populations almost as separated from eachother as those in the Old and New World suddenly came into contact, which must have caused more of these local pandemics. (This is not a new insight, of course. E.g. it’s been evoked as an explanation for the temporary retreat of European hunter-gatherers.) These pandemics would be increasingly non-local, their reach growing in pace with the speed and frequency of trans-continental contact. Those living in the hubs — the seafarers of the Mediterranean and Southeast Asia and the proto-caravan traders of the Steppe and North Africa — would at the same time be more exposed.and more resilient to diseases, and when they spread a disease that happened to bring a less resilient population almost to extinction, they would be in a position to move into the region. I was imagining Diamond’s scenario, where the pathogens spread along with their domesticated animal hosts. @Brett: I worked for several years as an editor at a couple of different scientific journals with international reach, and if anyone asked me who wrote the best scientific English, I always used to say the Swedes. I think that the generally high quality of non-native English from Germany and Scandinavia has relatively little to do with the phylogeny of those languages and more to do with the good English instruction in German and Scandinavian schools. You’re probably right about the effective instruction, but then I wonder: does the instruction “take” because of the closeness of these languages to English? For the North Germanics, as for the Dutch (a language unrepresented here), foreign languages are pretty much essential, but outside the STEM fields Germans can get along pretty well in German: why do they learn English so well? Y: I was imagining Diamond’s scenario, where the pathogens spread along with their domesticated animal hosts. Yes, obviously, now that you say so. I was just going to write something in the other thread about how the dense agricultural belt from Iran to Central Europe probably was an early zone of shared pathogens, and that we may well find even older strains of the plague having been endemic there since the invention of granaries. In less densely populated regions, even though animals did carry disease, they wouldn’t be carrying it longer or faster than their human keepers would let them. When a pathogen made the leap from animal to human hosts, it would be the “local pandemic” scenario. I suffer from not having read Jared Diamond. Another thought. There are pathogens that are transmitted from animals to humans but don’t spread in humans, and then there are pathogens that make the leap completely and spread in humans. With the former type, it would probably be quite obvious that coming near a cow kills you, and this would be a strong impediment against the adoption of domestic animals. With the latter type, the front of animal keeping would be preceded by waves of epidemics that cleared the ground and/or made the surviving population resilient. Would the spread of a domestic animal be dependent on the development of a sufficiently lethal pathogen? Consider smallpox; proximally, it was a human disease, probably descended from cowpox. Cowpox, by one hypothesis, first arose in East Africa through the adaptation of newly introduced camels to a warmer climate. But when smallpox was introduced to Polynesia, it was not mediated by cows, nor by camels, but by human carriers. You can’t obviously identify the carriers, unless they are actively ill (which Native Americans knew and recognized well). In the Mississippi Valley, the diseases came first, then the European humans who introduced them, and the livestock last of all. Basically everything Brett said, except I’ve probably reviewed more like 20 papers in my busiest year. I have successfully identified authors as Chinese in supposedly double-blind reviews. For the North Germanics, as for the Dutch (a language unrepresented here), foreign languages are pretty much essential, but outside the STEM fields Germans can get along pretty well in German: why do they learn English so well? Because they don’t expect anyone else to learn German, is the short answer. Leave the country on a holiday, and as a German monoglot you’re practically reduced to choosing between Austria, northeastern Switzerland and Mallorca. @Y: Very interesting about the Cherokees. It’s more or less how I imagine Neolithic societies to have reacted to human-borne diseases. Having experienced epidemics before, they knew that they spread with humans from one village to the next, and that quarantining might fend it off until it’s over. Until the next outbreak. So what did they do to stop the next outbreak? The plague paper makes a point of mentioning the European Neolithic custom of burning settlements to the ground after a few generations, which has puzzled archaeologists for a long time*. Mega-settlements were usually short-lived and were regularly abandoned, burned, and reconstructed after some 150 years. However, after ∼5,400 BP, such settlements were no longer built for reasons that are not yet fully understood (Diachenko, 2016). […] In fact, the presence of infectious diseases is a suitable explanation for the massive burning of houses and rapid abandonment observed in mega-sites. Response to human-borne disease explains it well enough, but it would make even more sense if people knew that the disease was transmitted by rodents in the house (or their fleas). And it’s a suitable explanation also in the case of smaller settlements and throughout the European Neolithic. Fumigation: Another theory posits that the fires were used for sanitary reasons to smoke or fumigate a building, in order to get rid of pests, disease, insects, and/or witches. However, the evidence does not support this viewpoint. All of the structures within these settlements were completely burned and destroyed. Because the damage from the fire was almost total for the entire settlement, it would be illogical if fumigation was the only intent. Germans can get along pretty well in German: why do they learn English so well? Possibly they were, though. As I’ve often read, academics are full of hubris and generally not well-paid, so they have every motivation to save a dime and demand concessions on the communication front. as a German monoglot you’re practically reduced to choosing between Austria, northeastern Switzerland and Mallorca. We can add the Netherlands, since the Dutch seem to have given up pretending that they don’t understand German. Drug dealers never affected this inability, of course. Also most of Hungary outside of Budapest where the locals’ inability to speak German is as good as their inability to speak English. Turkey is another monoglot country where the odds of finding a capable German speaker in a random situation are often better than the odds of finding an English speaker. There’s a specific reason for that – not because Turks easily learn German out of intellectual curiosity, but because of the many millions of Turks who over the last 60 years moved to Germany to work, lived here for decades, then moved back to Turkey on their pension – as they originally intended. 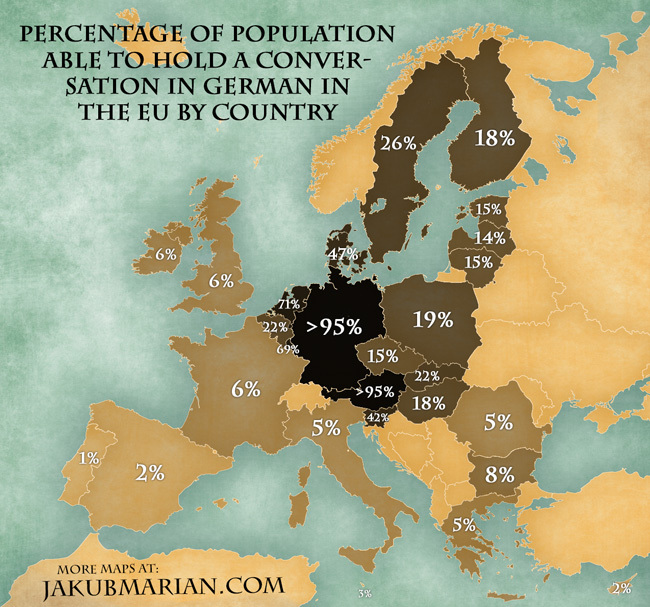 Percentage of population able to speak German by EU country. Luxembourg is a great surprise. I thought they were a German-speaking country! @Y: Thanks. Very interesting about Cheyenne disease containment. There’s a follow-up comment waiting in the green room. I sat up too late writing it, was too tired to edit properly before posting, and then too tired to remember that editing the link after posting is a bad idea. Also me (in the released comment): It’s more or less how I imagine Neolithic societies to have reacted to human-borne diseases. That sounds too prescient. Imagined, as in toying with ideas since beginning to think about it at all two days earlier. Probably they’re just too modest and understood the question as “flawless Standard German” as opposed to “fluent and understandable”. Yes, I still regret not having given my Langenscheidt Taschenwörterbuch Türkisch: Türkisch-Deutsch/Deutsch-Türkisch to a young man who was eyeing it wistfully when I was in Turkey; it was the only dictionary I had with me, but I knew I’d be getting an English one eventually and he could use it more than I (and would have a harder time getting a copy). But I was lazy and selfish. However, I suspect that the tradition on Dutch sightseeing boats of giving the German translation of the current sight last (after Dutch, English, and French), thus segregating the German tourists into the stern and looking backwards, still persists.